Comprehensive Operation Sinai 2018 (COS) has unfolded rapidly since Friday. The massive operation, a wide-ranging confrontation against terrorism primarily focused on North and Central Sinai, has also included operations in the Delta, Nile Valley and Western Desert, and has organised crime as well as extremists in its crosshairs. The first communiqué issued by Military Spokesman Colonel Tamer Al-Refaai revealed the ultimate aim of COS 2018 — the complete eradication of terrorism, securing complete control over all borders and insulating Egyptian society from the dangers posed by terrorism, extremism and organised crime. General Mohamed Qashqoush, professor of national security affairs at the Higher Nasser Military Academy, summed up the operation thus: “There is a degree of surprise in an operation of this scale. The president was involved in his various political duties and activities, the government was functioning according to the usual patterns and then, suddenly, this huge operation starts. In this context it should be noted the military spokesman announced that in tandem with the launch of COS the Egyptian navy staged a number of training activities in the Mediterranean which included the firing of land-to-sea and surface-to-sea missiles. These exercises took place, he said, “in the framework of training to rapidly respond to all threats and hostile acts against our territorial waters”. The implication, says General Qashqoush, is that COS has been deliberately conceived to drive home the fact that Egypt’s military can operate in multiple directions simultaneously. And there is another implicit message “directed to regional parties, spelling out that while Egypt is stable, this does not mean it is lax”. General Gamal Youssef, political science professor and former deputy director of General Intelligence, says that the shape, scope and the nature of forces participant in COS make it clear the campaign is about more than fighting terrorism. Youssef told Al-Ahram Weekly it is important to focus on the messages the operation conveys to parties abroad which are directly connected to Egypt’s domestic situation. With Islamic State (IS) defeated in its former heartlands of Raqqa and Mosul, terrorist fighters are searching for an alternative battlefield and some are being deliberately steered towards Egypt, says Youssef. Turkey is not the only intended recipient of the messages conveyed by COS, he adds. Libya, which poses a threat to Egypt because of the security breakdown there and the infiltration of terrorist elements and arms, should also be included, as must Qatar which supports the Muslim Brotherhood who is a key player in the anti-Egyptian front abroad. Tarek Fahmi, director of the Israeli Studies Unit at the National Centre of Middle Eastern Studies, says three distinct positions towards COS have emerged in the Israeli media. The first is based on an assumption that Israel helped facilitate operations in Sinai, beginning as early as the Eagle and Martyr’s Right operations, and that it should receive some kind of payback when the operations are over. “Some observers from this camp are trying to promote the idea of a land swap in the framework of settling the Palestinian question,” says Fahmi. A third trend, says Fahmi, is worried the Egyptian army has moved too close to the Israeli border. All three views contain misperceptions, says Fahmi: the Israelis are sorely mistaken if they imagine Egypt could agree to a land swap and there is a strong tendency to exaggerate among Israeli commentators who use expressions such as “facilities granted by Israel to Egypt in Sinai”. General Mohamed Ibrahim, director of the Israeli Studies Unit at the Egyptian Council for Foreign Affairs, argues the absence of an official Israeli response to COS — as the Weekly went to press no government statement had been issued — “may be due to Israel’s preoccupation with developments in Syria following the downing by Syrian defences of an Israeli F-16”. Meanwhile, on the eastern border with Gaza, for long a major source of terrorist threats, evidence has been accumulating about the role of Gazans in the Sinai Province terrorist group. A video showing IS operatives from Gaza executing another Gazan accused of collaborating with Hamas, recently emerged. 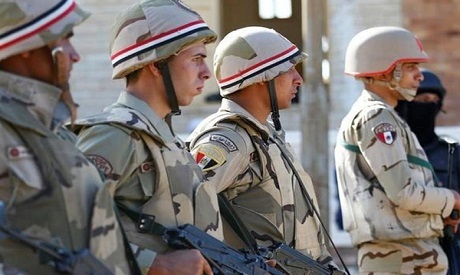 Reports that the current leaders of Sinai Province are from Gaza have also been lent credence by information gathered during the interrogation of terrorists detained in the last few days. They have confirmed the current commander of IS Sinai Province is a Gazan called Rasem Abu Jaraz. In this regard sources in Cairo have been keen to stress there is no link between the latest visit of Hamas leaders to Cairo and the launch of COS. Cairo did not coordinate with Hamas over the operation and the visit by the Palestinian delegation was scheduled in advance. To the west, combing operations have been launched along the entire length of the border with Libya. During the opening days of COS these led to the elimination of a terrorist cell that had infiltrated into Egypt.